Many readers do not realise this, but it is a fact the internet has changed forever, much about this hobby. The most obvious is that due to the vast amounts of email communication, both private and business almost no-one needs to send basic mail pieces these days, compared with even a decade back. Many forget easily, but back in 1999 very few collectors reading this magazine had an email account. Even many of the VERY largest dealers did not have websites, and most did not own their own domain names. In your non philatelic “snail” mail today I bet you are seeing a 4 fold reduction on paid items in your mail box versus a decade back – I certainly am. 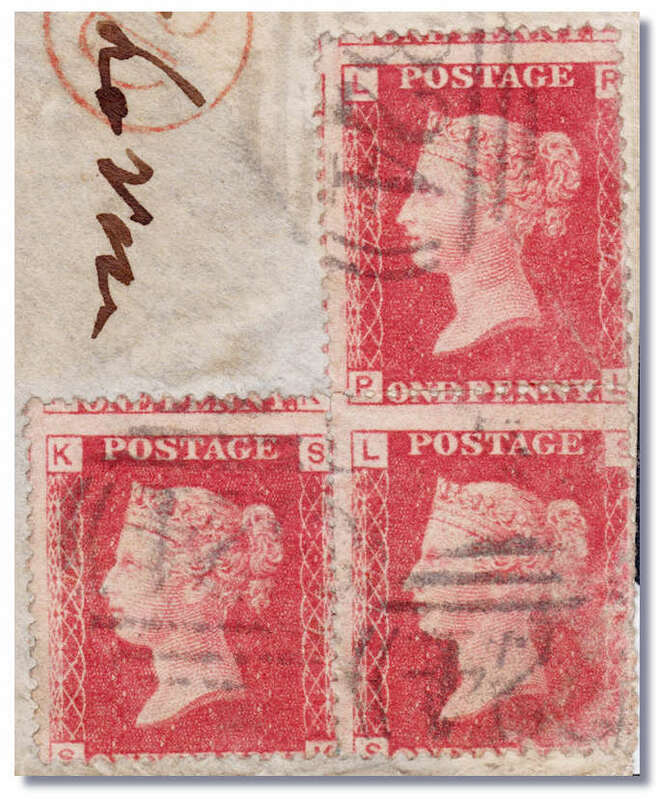 Even many stamp auction catalogues arrive to me via a link to a website - not a printed volume in many many cases. There are few if any retail stamp shops these days – in cities where they once flourished. 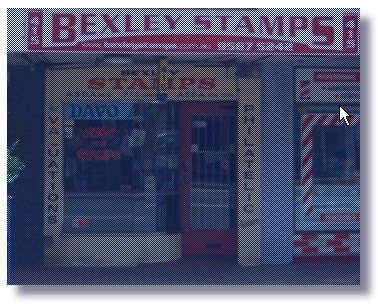 Sydney, the largest city in Australia has just one stamp shop in the entire CBD area now. And only a few exist in the suburbs .. and I mean you can literally count them on the fingers of one hand. Collectors buying on the internet are driving them out of shop locations. It is not “high rent” as the cause, which is the glib reason often given. Rent today is no more out of kilter with the average wage than it was in the 1920s or the 1950s. Many shops in a fair location cost about a week’s average wage to rent. They do today, and they did 50 years ago. Rent has never been especially cheap, but a good dealer always seemed to make it pay off, as a good dealer attracted loyal clients to the shop, who helped pay that rent. This is the present day reality for a city of 4 or 5 million people – ONE shop downtown - and the same trend is occurring worldwide. 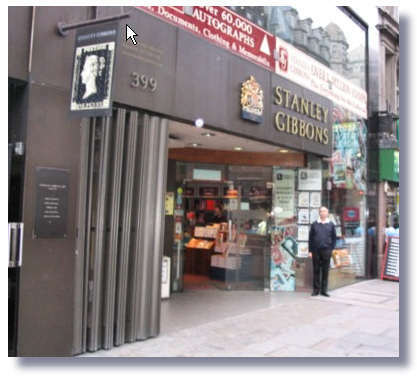 Stanley Gibbons at 399 Strand London, is a glowing exception. Graeme Morriss, a Manager of Seven Seas Stamps in Sydney posted the nearby photo this week on stampboards, from his recent visit to the famous SG shop. The stamps we all buy today are more and more and more web based in some way. I used to mail out many 100s of printed pricelists a month of special offers – as recently as a few years back. Indeed I was canny, and asked collectors to send me 10 or so SAE’s and I’d mail them, and they’d get whatever nice cancelled stamps they wanted. Worked for everyone, and I had a box with THOUSANDS of such SAE’s sitting in there. Not for years have I bothered. I do not even produce any kind of pricelist these days. Near EVERYTHING goes on the internet. And the same is true for many dealers. 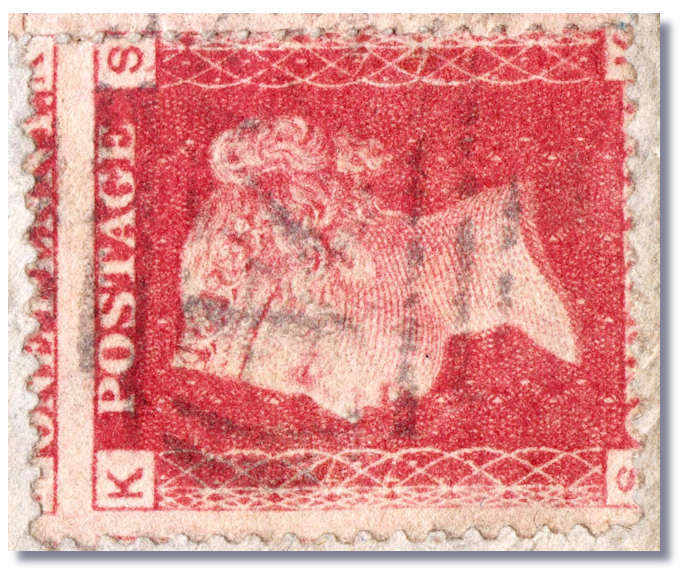 Sites like eBay have taken a huge slab of business that retail stamp shops once had entirely on their own. A large city stamp store would each week sell HUNDREDS of sets of new issues and thematics and mini sheets sets to regular clients. At the typical $1 - $2 mark up on cost, there was the rent paid – right there. All other business that week was the cream – or the profit. The profits now go here. Most collectors now source them on sites like ebay. For stamps and sets such as those, worth a few dollars a set, it is very convenient and often well priced. In that respect ebay is helping the hobby, as if often brings in NEW buyers of stamps. Get stiffed on a $5 set, and you are hardly bankrupt due to it. HOWEVER, my oft given warnings about buying ANY stamp lot worth more than 3 figures off ebay etc, from someone who is NOT a member of leading dealer bodies PTS-ASDA-APTA-IFSDA remains stronger than ever. ebay is heavily shark infested waters when it comes to pricier stamps. Masses of forged overprints, forged ‘OS’ and state perfins, forged cancels, and other total fakes have infested ebay. In Australia many dozens of accounts linked to one person selling stamps have been closed, and this person keeps on opening up new ones. “Bunnies” on ebay – often totally unsophisticated buyers - flock to chase down these alleged “bargains” of course .. it is way too tempting. When the accounts are closed down - and they always are - the “Bunnies” are left holding forgeries they often paid many $100s for. And of course often leave stamps forever, when the reality is passed onto them by a dealer or collector that they were fleeced. They generally have no recourse for a refund, except to contact the now long abandoned PO Box set up under a false name. The “unconditional money back guarantee” these cons ALWAYS offer is not going to be honoured is my bet! Yet the bunnies see that promise in writing, and bid recklessly and confidently. ebay does not care at all, as they make just as much money when fake stamps are sold, as genuine ones. www.stampboards.com and other sites each month show endless examples of dodgy and forged and bogus material being offered, that ebay have ignored removing. So ebay is a superb place to chase up truly difficult material, super elusive stamps, and cheaper topicals etc, BUT for pricey mainstream stamps into 3 figures, keep your eyes WIDE open. A MUH 5/- Bridge from Max Stern etc might cost $100 or so more than from the anonymous ebay seller, but from Max you will KNOW the gum is genuine! The brain dead dopes who bid this ugly Tasmania SG1 mid November for $1110 boggle the mind. The seller was from BULGARIA of all places, and had zero feedback. And had all sorts of other early imperf States material also “going surprisingly cheap”. Hmmmm. Never mind all that, the “Bunnies” all chased it up to $1,110, as it is SG cat £6,000 - so must be a “bargain” – right? Yep - and so are those Nigerian bank emails, if you believe that. WRONG. The ebay seller has now vanished it seems according to the stampboards sleuths, and anyone dumb enough to have paid for this deserves to lose their $1,110 in my book. Any REAL dealer would gladly have sold a cut into and ugly copy of this for way less than $1,100! That’s the bizarre part. And you get a guarantee you’ll receive it! These folks do not even own the stamps half the time, and just scan up things from dealer websites or sale catalogues. They mail you a Registered envelope with folded up sheets of paper in there, and bingo your right to make a “non receipt” claim via paypal is gone as seller can prove delivery. See where the “unconditional money back guarantee” gets you then. So, see low feedback sellers, running “private” auctions, and/or with “hidden” feedback tables, and the alarm bells should be ringing LOUD and clear in your ears. No legitimate stamp seller has any need to hide feedback or keep stamp sales “private”. Both are near certain signs you are about to kiss your money goodbye to a shonk. And ebay makes detecting “private” sales REALLY hard these days. These are a paradise for fake or “shill” bidding ebayers, trying to push up legit bidders via bogus accounts, as usually when their “shill” gets caught out buying too many lots, it is otherwise obvious to all that “dxxxxp” is bidding on nothing else. If the same stamps were bought off real dealers, you can send them back for a refund the next month, even the next year, and you know that dealer is very likely to still be there. And if they are members of leading trade bodies you WILL get the matter sorted satisfactorily. The same bunnies would not even dream of buying a “genuine Rolex” for $50 cash at a pub on Friday night, so why they are mesmerised with the equally fake “Bargain” stamps the same spivs offer on ebay each day mystifies me. 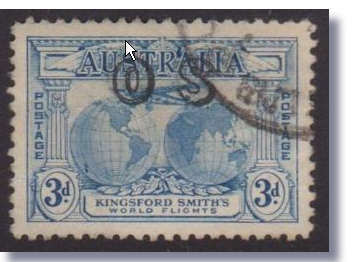 There were SEVEN bidders for an appalling forgery pair of the 1931 Kingsford Smith “OS” on ebay recently offered as “VFU” by seller julicalot2020 - a 5 year old could surely tell they were forged? Price on ebay - $63.90 plus post. I gave away a forged set of these on stampboards this week FREE along with a genuine superb CTO set – price $A80 the quartet. Ah, but why buy off “real” dealers, when the fakes “only” cost $64 on ebay! So the internet is where material is bought and sold as we enter into 2010. Older collectors may not like it, but their grandfathers probably did not like giving up horse whips or moustache wax either, but it is how things work in life! I am probably as good an example as anyone of the emerging internet boom, as I have been a full time dealer for about 30 years. I was the first dealer in Australia to get a fax machine (true!) and that was only early 1980s. Most of the trade had no idea what they were. My rarity page – www.glenstephens.com/rarity.html has the scarcer material added weekly. The cheaper $40 and up items and collections I generally list up on www.stampboards.com as it is free, and allows large size photos to be used. My website has over 300 separate detailed pages on it - for Lighthouse stockbooks, kiloware, Hagner sheets, under face postage .. you name it .. it is up there somewhere most likely. I have a 3 story house crammed with stamps, so that website offers many times more material that most old style stamp shops ever stocked. 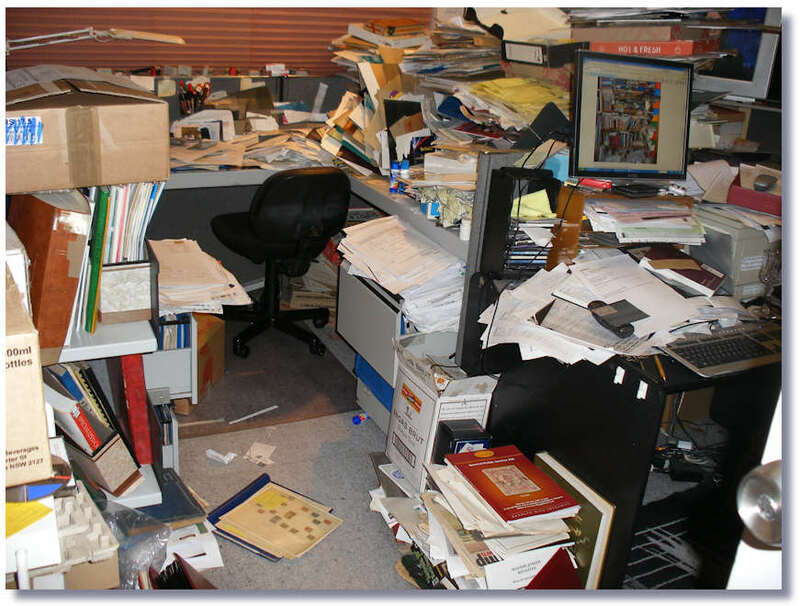 For some idea of the debris I live and work among, that will keep your wife from EVER complaining about your mess – take a look - www.tinyurl.com/stampmess – the photo nearby is mild! It is a very basic website, no bells and whistles, but it works better than many sites I see, where some pimply faced 20 year old tech geek has set up the “latest and greatest” site for a generally clueless business. And in the process charged the dealer/auction house 5 figures for something, that is for that dealer, near totally useless in many cases. Stamp sites do not need to mirror www.qantas.com or www.hilton.com – a very basic site works just fine. My site is sneaking up to 2 million unique page views since inception, and even many large stamp auction houses do not get that traffic. However that traffic is chicken feed contained to the busier sites. www.stampboards.com gets well over 2 million hits a MONTH these days, and combined with the number of dealers also having websites, it is the way of our business in this century. I hardly write or receive a cheque these days. If someone pays me, they do so in 99% of cases via paypal, bank transfer or credit card. The notable exception re cheques is the USA, where for some obscure reason free bank transfers have been actively blocked by the banking industry. When folks mail me stamps for sale I can do a bank transfer (locally) or paypal payment to them for the agreed amount, on the day I get them. Neither option costs me a cent, and it is wonderfully FAST. True story - a collector in Boston needed around $US1,000 for an urgent bill this week, and being out of work right now was finding it tough to cover, and it needed to be paid by Friday – no exceptions. I suggested mailing me some used Roos I knew he had bought a couple of years back in top grade. I got the stamps USPS Express Post Wednesday, and I was able to paypal the money, $US1,000 same day. He paid me $A1,200 for them a few years back. However at that time that only cost him $US800 due to the strong greenback. So I buy them for less than he originally paid in $A, but he got 25% more in USD than he paid, and most important - he got it when he really needed cash. Win-Win for both of us. This neatly underlines the beauty of buying good quality stamps. At times like this where you need some money FAST, you are generally in a position to achieve that result. All dealers enjoy buying back quality material, and if you buy good stuff, you often come out in front. That kind of paypal payment transfer was not possible even 10 years back, and the internet is what has done it. The internet has also had another side effect …. it allows vast “stamp clubs in the sky” to exist. Imagine your local stamp club meeting, but instead of 12 members present, there are hundreds – even thousands. That is what is occurring on-line in some areas. The large international boards like www.stampboards.com have become the local stamp club for many collectors who no longer have one nearby. These days everyone reading this has either a scanner, digital camera or mobile phone that can take photos- or often all 3. Loading photos of your stamp queries or prize items onto these boards is dead simple and is free. If you can 2 finger type you are away. There are active mid 80 year olds doing it. Here is the kind of thing you can do shown nearby … ask for someone to decipher an address on a WW1 POW postcard, and within hours it is all undertaken, and many collectors have fun in the process. These boards also have their fun side. There were several Melbourne Cup “Sweeps” in November where not only were there cash prizes of $120 per sweep, but many goodies donated by Australia Post and dealers. There is a “Secret Santa” program running right now as it was such a global success last year. In mid November a box of Deluxe leather 2008 annual albums worth about $750 were also given away to members worldwide via the generosity of Australia Post, so to some, it is FAR more interesting than many local clubs! One of those Leather PO albums was given away to the author of whatever the ~3500 members voted was their “Favourite” thread of all time. As there have been nearly 15,000 different discussions since inception in 2007, that is a lot of threads to choose from. The easy winner from all the member voting was a very interesting debate which has raged for well over a year. I wrote about this discovery in my column here of August 2009. What is interesting about this type of discussion is that even 10 years ago, it was not possible to do. 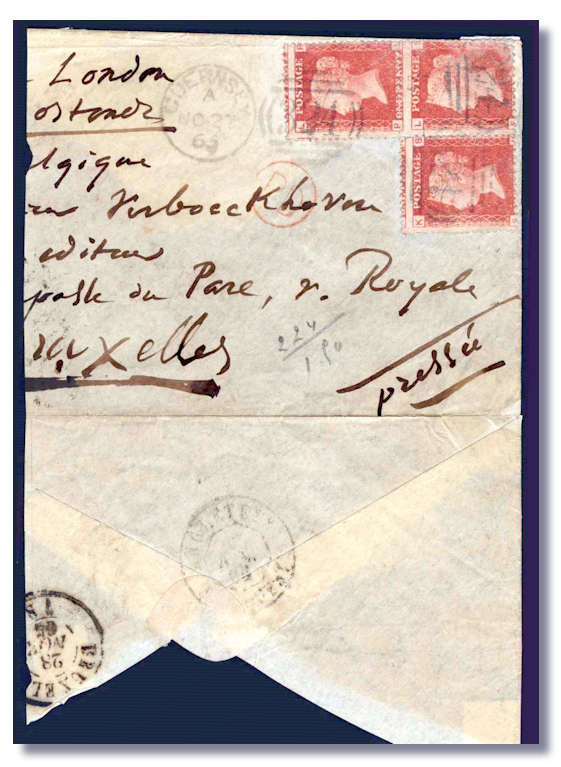 The discovery was of a 1865 part cover from Guernsey to Brussels Belgium in an old collection job lot in Europe, where the plate number had not been recognised. There are 100s of detailed colour photos, and charts and graphs, and large blow ups and whereabouts of the other known existing plate “77’ examples. All added by members all over the globe. www.tinyurl.com/plate77 caries the complete discussion, which to date is some 1,200 different messages, with about 50,000 page views so far. However stampboards members voted this as their favourite thread of all time, as it may well be history in the making. One member “stampmann” (Grahame Mann) from Torquay UK who is a long experienced specialist dealer in GB 1d Plate numbers reports he also found a “77” cover in recent years, and also got a bad certificate. He knows his stuff backwards, and felt sure he had the real McCoy and a plate 77 (E.I.) but dejectedly sold it for £1½d at Stampex described as the plate 73 that he was advised it was by the “experts”. His May 1992 RPS Cert (which he shows on the board) says – “Used on cover is NOT plate 77.” Understandably he is now furious he sold it for a song, and did not back his judgement. The trio on cover saga however, has soldiered on substantially since my last column. The two initial “Certificates” decided the 3 stamps on cover were NOT bearing plate ‘77’ stamps. 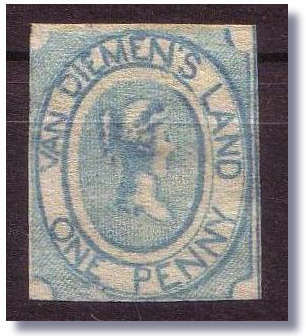 Like many major stamp discoveries, the stamp establishment is never terribly keen to accept on face value, something clearly very valuable, they did not know existed before. Especially in the very conservative British stamp world. As you will see in the highly detailed reports here – www.johfail.notlong.com - senior forensic Scientists and technical labs, using electron microscopes, and a million dollars of analytical equipment, see no evidence whatever of faking or alteration. Najjar spent several £1,000’s, and a great deal of time, and went out and got those highly technical forensic reports on this cover. However after the discussions on stampboards and my last column, Najjar further commissioned Robert Radley, a leading paper and forensic expert to take the specific RPSL and PF opinions and analyse them point by point. This super detailed Radley report is found on -www.tinyurl.com/radleys and is well worth a close read. In summary this expert showed that both the opinions were total nonsense, and were not supported by a shred of scientific or forensic evidence. And make no mistake, the writer of this report condemning both Certificates is a world leading expert. If this was a Court Of Law, the RPSL and PF views would be tossed out unceremoniously. I’ll summarise here from his website CV, which shows this is no amateur crackpot giving an ambit off-the-cuff view! Robert Radley holds Degrees of Bachelor of Science (Hons) in Chemistry, and Master of Science in Forensic Science. He also holds a Diploma of the Forensic Science Society in Document Examination and is a Chartered Chemist. He is a Registered Forensic Practitioner. Mr Radley is a Fellow of The Forensic Science Society, a corresponding member of the American Society of Questioned Document Examiners, a Fellow of the Academy of Experts, and a Fellow of the Royal Society of Chemistry. He has successfully completed the Assessors' Course for the Council of the Registration of Forensic Practitioners, and was an examiner for the Forensic Science Society for 12 years with respect to their Diploma in Document Examination. Since 1971, Mr Radley has been consulted in over 9,000 cases involving questioned documents with instructions received from all over the world. These generally relate to signature authentication and/or handwriting identification together with other areas of document examination which are dealt with on a routine basis. These include non-destructive instrumental analysis of inks, paper, alterations, erasures, typewriting, printing, indented and electrostatic writing impressions in documents (ESDA), photocopy examinations, dating queries, determination of sequences of writings etc. He has given evidence on several hundred occasions as an expert witness in the courts throughout the UK, and also courts in Australia, New Zealand, Brunei, Hong Kong, Singapore, Malta, The Hague, The Republic of Ireland, Jersey, Cyprus, Germany, Switzerland, Kenya and Gibraltar. Radley’s laboratory is extensively equipped with the necessary instrumentation for the forensic examination of documents. It seems very sad that someone discovering a major piece needs to spend £10,000 or whatever, and 100s of hours of time, to offer tangible proof beyond all reasonable doubt the item is exactly what it appears to be. 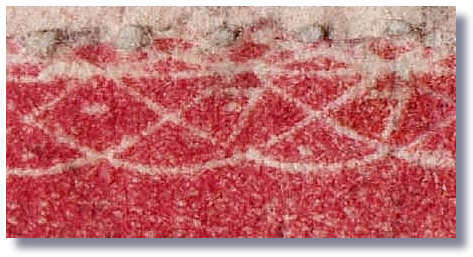 Which is - a cover with 3 stamps, each showing the number “77” on each side, and all untampered with. I understand the cover is back with the PF in New York to re-expertise, in view of the barrage of science that has appeared since they last looked at it. Their (then) leading “Expert” Richard Debney was categoric it was forged, as his hand held magnifier gizmo said so, and interestingly is no longer on the PF Expert Committee. Debney may regret typing this about it - "I am completely happy with the opinion, and am willing to put at stake my thirty-two-year professional reputation upon it." Doubtless it will be re-certified, and then sent back to the RPS London for them to take a new look at it. All in all an exciting story, and it does show that without the global debate that the internet allows, this cover may never have been accepted for what it clearly is. Clearly a ‘77’ not a 73. There seems no doubt whatever the 3 stamps all show “77” and are un-altered. Yet bear corner letters that otherwise are associated with Plate 73. The reason for this has yet to be determined. “In my mind I have no doubt, that this was an 'attempt' at manually making the plate number visible on some impressions, in which the number was unclear. Search all my 300+ web pages! Simply type in what you are looking for. "Penny Black", "Latvia", "Imprints", "Morocco", "Fungi" "Year Books", etc! Using quotes ( " ) is more accurf used with no quote s. Search is NOT case sensitive. Tip - keep the search word singular - "Machin" yields far more matches than "Machins" etc.